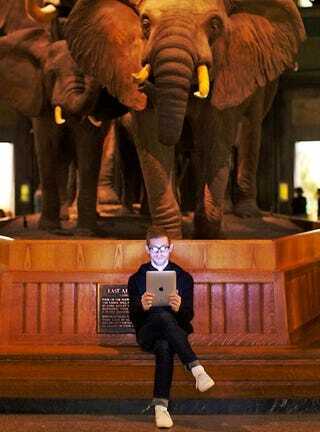 How and where you'll use the iPad are of the essence. Breakfast in New York. Sitting in a booth at Cafe Habana, people are staring as I type emails on the iPad. For now, it grabs too much attention, for better or worse, with its big swoopy animations and Skittles glow-erific screen. It's not as strange as if I were hammering away on a laptop. But it's no daily paper, either. When I start reading the Times and then Jack London's Call of the Wild, crossing my legs and leaning back, the feeling of unease goes away as it transforms into a newspaper, and then a book. I ate my eggs, which were starting to get cold. Using it while walking around the museum is quite strange. I want to prop my arms up on a rail or sit on a bench. Because it's almost impossibly dense, as if made from magic and lead. And while it's not at all out of place in the gemstone and meteor rooms, it is a little out of place when I try to hold it with one hand, while standing. But, sometimes it seems light. Indifferent to its actual mass, the feeling of it being too heavy seems influenced greatly by how we hold it:. There's a screen to smudge, and so I don't grip it with much more than fingertips as if I am holding a freshly excavated dinosaur bone that would shatter if one of the other museum patrons bumped into me. Tyrannosaurus Rex looks so cool. I wonder how stronger animals were made extinct while soft, squishy mammals rose. Probably, good software and power management. I jump into a cab and consider using my iPad, but only for a second. Wrong tool. Instead of using it with the pocket Wi-Fi hotspot we have, I whip out my iPhone for the five-minute ride. This will never change. I recall when Apple unveiled the iPad and how the internet decried it for not having Flash. Some say it will fail for this very fact. I stay up until 4am the night before the first day it's on sale, searching for iPad specific apps. I find very few high-quality programs, but I do find some: Words With Friends, an asynchronous scrabble clone. Wundermaps, for keeping an eye on snowstorms using radar animations. Netflix streaming, Pandora and the Epicurious cook book. And after I find these few, I start loving the iPad more. I have to be up in three hours. But I cannot rest, so I I try to find a video on Netflix streaming to fall asleep to. I pick the September Issue, about Vogue's biggest month ever, shortly before the print media collapse. I lie down and I prop it against a pillow, but slips around a bit. I finally find the right position, sitting up like, well, I'm on a couch. Sometimes, it needs a kickstand. Sometimes, my arm, or my knees are that kickstand. We are late to Easter dinner at Chris and Alyssa's place, in the West Village. Laptops are left at home but iPads are on the loose. Eating prosciutto and mozzarella and basil with our hands, we go heavy on the napkins to keep the screen from getting even smudgier. Appetites are sated and then pressed, and Alyssa gives us a lull before the main course to digest, watching the sun go down with a smoke. Sitting on the couch, we watch movie trailers, and the generous screen is good for a pair, or even three folks at once, although the speaker's noise comes out lopsided out the right. Dinner's lamb and pasta are served. Afterwards, we eat cookies and play Scrabble on our iPads, juggling five games at once between each other. I discover that the iPad is, beyond all other things, a computer for people who love lounging, but it doesn't have to be one man or woman per pad, either. Back in my stuffy hotel room, I sit on a couch—the one true place where the iPad feels just right to use. One article is from The Bold Italic, a San Francisco "web magazine" my surfing buddy Jaimal Yogis writes for. Every page is lush. I've never been able to sit down and read an article on my laptop because it feels too much like long form for a computer. Long form being the kind of reading I do on a couch, in my bed, on a blanket during a picnic in the park. Unlike a lappie, it works perfectly, here, now, with no windowed apps to distract me, and no keyboard to incite data production from my fingertips. I check my surf and snow sites and most of them work fine. Once, I see a video from some no-name site of the big storm that hit Tahoe with 50 inches of snow last week while covering the iPad launch in NY. It doesn't work. I am too stoned and cozy in my fuzzy blanket to get up and walk to the office. I bet that video was really good. Every time this happens, I get a little upset, which eats away at my affection for the iPad. This happened 3 times today, and will happen many more times before mom and pop websites get rid of Flash. The battery lasts long enough to escape worry. It's time for a work break. I load up an ebook and go to the office roof deck. I come back down in a minute, eyes frazzled from overwhelming screen glare. Imaginary plans for a computing picnic and work days on the beach are summarily and permanently canceled. News is like coffee to me. To wake up, every morning I hit snooze twice and on the third beep I kill the alarm and lie in bed checking email. Monday morning, I did the same on the iPad. Reading emails was far easier with everything laid out on two columns and with all that extra screen space. But my threshold for replying to notes was not improved. The keyboard does not feel natural, and this is not an input machine. I flagged those emails as things I'd have to revisit at my laptop, on my iPad with an external keyboard, or maybe even the iPhone, which I'm so used to that even the smaller layout seems better. I pack up all three work machines and get out the door. I could get away with two, leaving the pad at home on the couch, in its natural place. I'm packing for my flight home to SF, and drop some movies onto the iPad. Loading one takes strategy: I don't bother transferring much more than my last few new albums, because it is too big to use as an iPod. So I save space for higher resolution videos that do the big screen justice. I'm looking forward to using it in air, because I'm done alternating between holding my iPhone up to my nose or at arms length while watching flicks. I don't think the 16GB is a viable size for movie lovers. Size counts. iPad launch meant long hours, and I am glad to be going home. In the air, I nap as we ascend. When I wake up, and log on to Virgin America's Wi-Fi, I finally have the time to fall in love. The new flavor of interface puts menus on the left and stuff on the right, so you don't have to click around much to switch between emails, tweet streams and songs, compared to on an iPhone. What I do is type this note. Then I notice, sometimes it thinks it's still an iPhone, and not a computer. Work people IM me, and the resulting popups ruin my focus mid word. To switch to AIM from my notes, I have to hit the home button, swipe to another home screen and open another program... "This is not how a computer should behave," I mumble. I use the case to prop up the pad tall for movie watching, and flat for typing. Best of all, I fit the small computer on my tray with a sandwich, and when the passenger in front of me reclines, it does not bash my screen. I start to get used to touch typing. Imperfect at a sprint, but serviceable at a light gallop. I wonder if I should read, play a hand of Scrabble or watch a movie next. Instead I read the Times, then switch back to Call of the Wild. Eye strain never comes; I stare at screens all day for work, I need no soothing other than to dim the brightness. After turning the animated pages by swipe gets distracting, I tap to flip them. The experience, from font to page numbers to the mock up of a real book, to the landscape spread or portrait zoom, to the color wood bookshelf, all work for me. It's time to land. With toys like these, flights seem short, and laptops seem like overkill. Wilson let Eleanor play with it. Kids seem to get it, like they do with many touch interfaces. Mark showed it to his mother, Leslie. After a few days on the road, I'm home in California. I'm working in an empty house instead of the noisy office in New York. I keep the iPad next to me to check on the simple things like the weather, surf, snow, play some music, and look at pictures of people I love. It's a little bit better than a second monitor on a computer. The iPad is sitting on my couch, there's nothing much I want to do with it right this moment, and so it sits crammed between some cushions. It hasn't changed my life, or the game, yet. I still need, at the end of a long day, a meal, a smoke and a hot shower and like my stack of ignored magazines, the iPad sometimes gets ignored, too. I can tell that until the app library and firmware and even hardware mature, I will have many moments hunting for some use for the iPad. It's not tomorrow's computer, yet. "Should I get an iPad?" asks a friend. "That depends," I say, "It doesn't do anything you can't do with you phone or laptop, and it's not really great at work or outside the home." "So I shouldn't? Should I get something else?" she asks. I interrupt, "But there is nothing else quite like it. And it does a few things, in a few places, better than anything." Continuing, I say, "Tell you what—Before even thinking about buying one, go poke around iTunes, and find some apps you might like. Figure out where you'll use this thing in your daily life, and what you'll do with it. It's different for everyone. And try it. Then you'll know." Finally, Joel summarizes how we all feel about it, after a few days of settling in. Photos taken by Matt Buchanan using a Canon 1D Mark IV. Thanks to Chris Mascari for his modeling services. Special thanks to Canon, and to BorrowLenses.com for supplying some of the cameras used for video footage seen here.